Sunday’s Music for Food concert in MIT’s Killian Hall offered three contrasting chamber works within its theme of the year: “Schubert’s Vienna/Our Boston.” In the middle of its eighth season, this ambitious non-profit is expanding into a dozen chapters throughout the country, funding over 500,000 meals from concert proceeds. While these events appear to be yet another venue for familiar faces on the stage and in the audience, the underlying passion for making a difference clearly differentiates it. Being welcomed by friendly, inviting greeters, I am quickly reminded that this series survives through the efforts of volunteers, both on and off the stage. If one takes time to consider the performers, many of whom sacrificed in order to carve out a path in music, we begin to understand founder Kim Kashkashian’s determination, perhaps originally fostered by her involvement in the Pro Musicis Foundation, to encourage artists to advocate for social justice with their colleagues, students, and audiences. 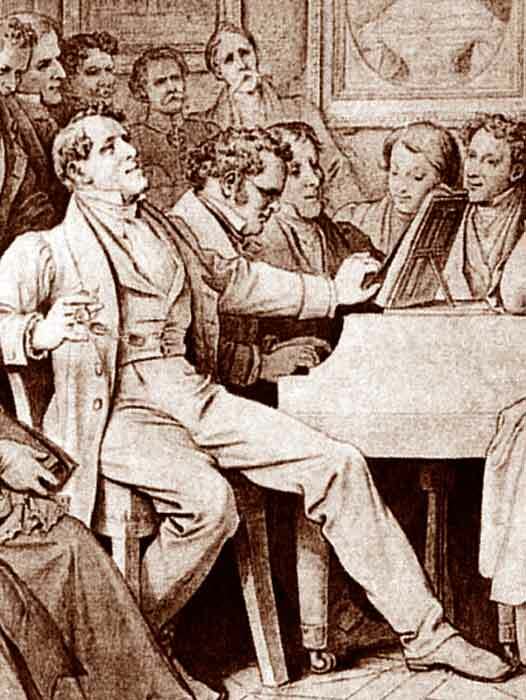 Beginning with five Schubert Lieder, baritone Josh Quinn brought shadowy reflectiveness, sensitive weightiness, solemn hesitation, and the occasional hopeful yearnings through these heart-rending settings of poet Johann Baptist Mayrhofer. Particular memorable moments occurred in the second setting, “Philoktet,” D. 540, with the emphatic and perfectly prepared silences of pianist Vivian Hornik Weilerstein, who personified the tragic Schubertian emotive throughout; a fine example of this multi-hued baritone occurred in the final setting, “Heliopolis II,” D. 754, where the lines “Let passion roar/in metallic harmony” rang true in authoritative splendor. The “Our Boston” facet of the evening brought MIT faculty Peter Child’s colorful and balanced Sonata for Viola and Piano. Violist Marcus Thompson and pianist Judith Gordon, for whom the work was written in 2000 through a Harvard Musical Association commission, showed care in revealing the predominating interlocking counterpoint and its resultant energy and exhilaration. The pointillistic, dance-like accompaniment, unisons as gestural anchor-points, and expressive leaps in the viola hinted at romanticism in the first movement, “Revel”. The second movement, “Pause”, balanced fantasy with plaintive (Feldman, à la Rothko Chapel) and was surprisingly virtuosic within the context of a slow middle movement, from the beautiful timbres sustained on the viola’s lowest string to sudden flourishes springing above the surface. This driving and bouncing third movement, “Lilt”, pushed to the conclusion, as a “walking bass” materialized in the piano and the duo coordinated syncopated punches with precision. The stalwart Parker Quartet’s take on Schubert’s String Quartet No. 15, hardly stinted on the difficulties in this immense and intriguing work. Their tireless technique delivered well-considered choices in dynamics and arrivals within the shifting landscape of members’ roles. The dry acoustics of the hall dampened the energy somewhat while highlighting the clarity of the individual voices and fine-tuned interactions among the performers. In the first movement, with its opening unified statement, they quickly transformed the beautiful melodic fragments above the contrasting weightless tremolos; within the arch of the movement they returned with concluding sonorous and fervent chords. In the Andante movement, the Parker Quartet once again embraced the placid openness, emotive drama, and thoughtful dialogues of melody and texture. With crisp and sprinting eighth-notes that encompass the Scherzo, the group shifted into a contrasting sensual playfulness to the central section. In the final movement, fierce romanticism and Mozartian lightness competed, on the verge of fatigue, reached apotheotic collision in the recapitulation. The activism of these generous artists is laudable, and the momentum of this movement and its increasing national stature promises a strong fight against through the advocacy and action of committed musicians. Their final concert of the season will be April 29th at the New England Conservatory and more information about Music for Food can be found here. David Stevens a Boston-based saxophonist and woodwind doubler, recently graduated from NEC with a double master’s in saxophone performance and music theory. In addition to performing, he works as an educator, arts administrator, and theorist.